International Women’s Day is a chance for firms to highlight the gender equality work they’re doing and this year many are pushing staff initiatives and charitable work as well as launching advertising campaigns. CNBC takes a look at what some businesses are doing. Budweiser has owned up to the sexism of its past ad campaigns by publishing three ads from the 1950s and 1960s alongside updated versions. The ads will run in The New York Times, Chicago Tribune and LA Times on Friday. “It’s a fact: Budweiser has delighted more husbands than any other brew ever known,” reads one of the vintage ads, side-by-side with a new one, that reads: “It’s a fact: Budweiser can be enjoyed by everyone, everywhere.” Bud is partnering with the #SeeHer initiative, started by the Association of National Advertisers to improve the portrayal of women in advertising. The drinks giant released a film featuring its chief marketing officer Syl Saller talking about the company’s push for an equal portrayal of men and women in its advertising. “Culture has been shaped by the stories we tell and if you think about it, advertising is telling stories that are backed by billions of dollars to have them heard,” she states. The company’s Guinness brand also sponsors the Women’s Six Nations rugby tournament and released a new ad this week featuring sisters that play for opposing teams. The snacks and beverage giant has given $18.2 million to non-profit Care, which will go towards providing five million female farmers and their families with access to education and economic support to help them increase their crop yields, according to a release emailed to CNBC. This is part of “She Feeds the World,” an initiative aimed at meeting the needs of a growing production. Create & Cultivate is an events organizer, community website and blog aimed at inspiring young women in their careers (it also works with brands — it ran a tour for Amazon in its promotion of the documentary “Lorena”). For those lucky enough to be heading to South by South West, it’s running an event in Austin, Texas on March 10 (not part of the official SXSW program) featuring investor Sarah Kunst, pro-surfer Bruna Schmitz and Diageo’s senior vice president of Whiskey, Sophie Kelly. Brands are getting on board, with sponsors including Mastercard, Volvo and Chandon. In a continuation of its “Shero” campaign started in 2015, Mattel has made Barbie versions of women such as British activist and model Adwoa Aboah, Chinese photographer Chen Man and Indian gymnast Dipa Karmakar. “The Barbie brand believes girls should never know a world, job, or dream women haven’t conquered,” said Barbie’s general manager and senior vice president Lisa McKnight in an online statement. 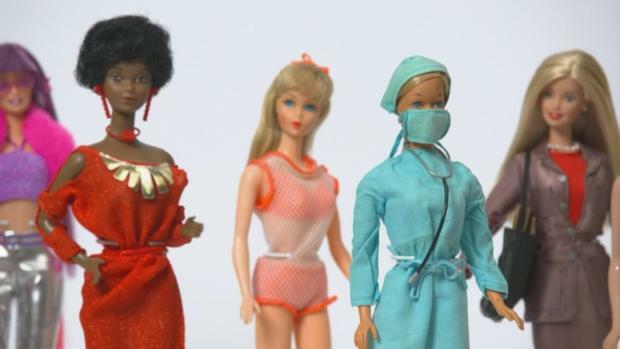 Barbie is celebrating a major birthday.The iconic doll is turning 60 years old. Benefit will take the unusual step of closing all 42 of its websites on Friday and instead will provide “resources women can use to hone their skills … and fight for balance in the workplace,” according to a statement emailed to CNBC. It’s also commissioned illustrator Allie Banks to create images of a diverse range of women. Amex isn’t doing any external marketing around International Women’s Day but has worked with LinkedIn to add “inclusive leader” to the list of skills on the networking site. It will also hold events in 25 of its offices and has announced that it will run its second leadership academy for women in music, an industry that has a traditionally male skew. The three-day event will be held in New York in June. The mobile network is working with Bright Sky, an app that helps to identify domestic abuse and violence and offers support to sufferers. Those who use it can record incidents securely and find their nearest support center. The app has already been downloaded more than 10,000 times in the U.K. since April 2018 and Vodafone is now helping it to launch in other European countries. Vans launched Vanguards on Wednesday, an initiative encouraging women to learn to skateboard, starting with a “girls skate jam” on Friday in Chicago and a campaign featuring several of its female team riders. Mars-owned Dove is building a marketplace for women in Ivory Coast, where they can sell fabric, soap and food, part of a $1 million investment Dove made into non-profit Care. The country is one of the places that Dove sources cocoa, so it’s in Mars’ interest to help the people who work there. Lyft is giving riders $10 off a journey that goes to or from places that honor women’s contributions to U.S. history, such as the Vietnam Women’s Memorial in Washington DC or the Harriet Tubman Memorial in New York. Locations have been chosen by Lyft board member and former Barack Obama adviser Valerie Jarrett, who is also interviewed in a short video discussing her career and the women’s movement. The Boston-headquartered Italian shoe website is running a promotion where shoppers can get 10 percent off purchases on Friday and the company will also donate 10 percent to Brave Enterprises, a company that teaches bravery skills to women and girls. Company founder Maria Gangemi has also interviewed female employees as part of a week-long campaign. Gap is selling forever favorite t-shirts, featuring words of inspiration, such as “I am enough.” The company chose the words of four women for the shirts, including women’s rights activist Noorjahan Akbar and Paola Mathe, a Haitian immigrant and founder of headwrap company Fanm Djanm. Other brands in the Gap group including Old Navy and Banana Republic are also designing t-shirts in support of women.